Odds ratios (ORs) per SD change in PRS for schizophrenia are shown (data markers), with upper and lower error bars indicating 95% CIs. The ORs are shown for a range of PRSs generated using lists of single-nucleotide polymorphisms (SNPs) meeting a series of P value thresholds. The bars indicate the log10 times the number of SNPs used to create the PRSs. A genome-wide significant (threshold P = 5 × 10−8) PRS was created from 111 genome-wide significant schizophrenia SNPs as reported by the second Psychiatric Genomics Consortium.1 Red lines indicate the null value. Importance Schizophrenia is a highly heritable, polygenic condition characterized by a relatively diverse phenotype and frequent comorbid conditions, such as anxiety and depression. At present, limited evidence explains how genetic risk for schizophrenia is manifest in the general population. Objective To investigate the extent to which genetic risk for schizophrenia is associated with different phenotypes during adolescence in a population-based birth cohort. Design, Setting, and Participants This cohort study used data from the Avon Longitudinal Study of Parents and Children (ALSPAC). Of 14 062 children in the birth cohort, genetic data were available for 9912 adolescents. Data were collected periodically from September 6, 1990, and collection is ongoing. Data were analyzed from March 4 to August 13, 2015. Exposures Polygenic risk scores (PRSs) for schizophrenia generated for individuals in the ALSPAC cohort using results of the second Psychiatric Genomics Consortium Schizophrenia genome-wide association study as a training set. Main Outcomes and Measures Logistic regression was used to assess associations between the schizophrenia PRS and (1) psychotic experiences (Psychosis-Like Symptom Interview at 12 and 18 years of age), (2) negative symptoms (Community Assessment of Psychic Experiences at 16.5 years of age), (3) depressive disorder (Development and Well-Being Assessment at 15.5 years of age), and (4) anxiety disorder (Development and Well-Being Assessment at 15.5 years of age) in adolescence. Results Of the 8230 ALSPAC participants whose genetic data passed quality control checks (51.2% male, 48.8% female), 3676 to 5444 participated in assessments from 12 to 18 years of age. The PRSs created using single-nucleotide polymorphisms with a training-set P ≤ .05 threshold were associated with negative symptoms (odds ratio [OR] per SD increase in PRS, 1.21; 95% CI, 1.08-1.36; R2 = 0.007) and anxiety disorder (OR per SD increase in PRS, 1.17; 95% CI, 1.06- 1.29; R2 = 0.005). No evidence was found of an association between schizophrenia PRS and psychotic experiences (OR per SD increase in PRS, 1.08; 95% CI, 0.98-1.19; R2 = 0.001) or depressive disorder (OR per SD increase in PRS, 1.02; 95% CI, 0.91-1.13; R2 = 0.00005). Results were mostly consistent across different training-set P value thresholds and using different cutoffs and measures of the psychopathological outcomes. Conclusions and Relevance This study demonstrates polygenic overlaps between common genetic polymorphisms associated with schizophrenia and negative symptoms and anxiety disorder but not with psychotic experiences or depression. Because the genetic risk for schizophrenia appears to be manifest as anxiety and negative symptoms during adolescence, a greater focus on these phenotypes rather than on psychotic experiences might be required for prediction of transition in at-risk samples. 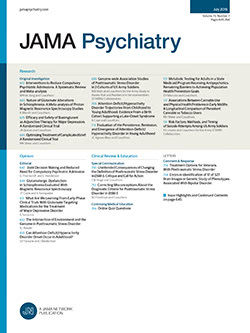 Schizophrenia is defined by psychotic experiences (hallucinations, delusions, and thought disorder) and negative symptoms (eg, blunted affect and apathy), although cognitive deficits are also common as is comorbidity with other diagnoses, particularly affective and anxiety disorders.6 Longitudinal studies show that anxiety, depression, and cognitive deficits often predate schizophrenia,7-11 indicating that these phenotypes might represent early expression of genetic risk for schizophrenia. Although genetic overlap across psychiatric disorders is common,12-15 knowledge of how genetic risk is expressed at different stages of the life course could foster understanding of the etiologic mechanisms and risk prediction and inform targeted interventions. Three previous studies16-18 have used a schizophrenia PRS generated from a GWAS training set that captured approximately 3% of the proportion of risk variance4 to examine associations with symptoms that characterize schizophrenia. In the first study,16 the schizophrenia PRS was not associated with symptom dimensions characteristic of the disorder in cases with schizophrenia or control individuals (while associations within the whole sample were attributed to confounding by case-control status). Similarly, another study17 reported no association with positive symptom, cognitive, and negative symptom dimensions in a general population sample of adolescents. Finally, the third study18 found no strong evidence that the schizophrenia PRS was associated with psychotic experiences at 12 years of age within the population-based Avon Longitudinal Study of Parents and Children (ALSPAC) birth cohort. Subsequently, a larger GWAS1 has been completed that explains a much greater proportion of risk variance, thus providing greater power to examine how genetic risk is manifest during development.19 We aimed to examine the psychopathological features associated with the early expression of genetic risk for schizophrenia and, more specifically, whether a schizophrenia PRS derived from the most recent GWAS is associated with (1) psychotic experiences, (2) negative symptoms, (3) anxiety disorders, or (4) depression during adolescence in a large population-based sample. The sample consisted of young individuals within the ALSPAC cohort. The initial cohort consisted of 14 062 children born to women residing in the former Avon Health Authority area with an expected delivery date from April 1, 1991, to December 31, 1992 (http://www.bristol.ac.uk/alspac/; all available data are given at http://www.bristol.ac.uk/alspac/researchers/access/).20,21 Data were collected periodically from September 6, 1990, and collection is ongoing. Ethical approval for the study was obtained from the ALSPAC Law and Ethics Committee and the local research ethics committees (listed at http://www.bristol.ac.uk/alspac/researchers/research-ethics/). All participants provided written informed consent. Genetic data were acquired from 9912 participants using a genome-wide single-nucleotide polymorphism (SNP) genotyping platform (HumanHap550-Quad; Illumina). After quality control assessment, imputation, and restriction to 1 adolescent per family, genetic data were available for 8230 individuals (more detail is found in the eMethods in the Supplement). The semistructured Psychosis-Like Symptom Interview22,23 was used to assess psychotic experiences (hallucinations, delusions, or experiences of thought interference) at ages 12 and 18 years. To maximize the numbers within our sample, individuals were deemed to have a psychotic experience if rated as having 1 or more definite psychotic experiences at 12 or 18 years of age compared with no experiences or suspected psychotic experiences only at 12 or 18 years of age. More details on the Psychosis-Like Symptom Interview and on the other outcome measures used in this study are given in the eMethods in the Supplement. Negative symptoms were assessed using 10 questions based on items from the Community Assessment of Psychic Experiences self-report questionnaire24 at 16.5 years of age (eMethods and eTable 1 in the Supplement). The questions measure negative symptoms, such as apathy, anergia, and asociality. Each item was rated on a 4-point scale (0 indicates never; 1, sometimes; 2, often; and 3, always). A total score was constructed based on the sum of responses (minimum score, 0; maximum score, 30). A binary variable was created using a total score of 14 as a cutoff that was chosen to define approximately the top decile (9.18%) of the sample. We defined individuals as having a depressive disorder or an anxiety disorder if they were categorized in the Development and Well-Being Assessment band predicting at least a 15% probability of clinical diagnosis, a cutoff selected to define the approximate top deciles of the sample. We conducted a series of sensitivity analyses using different phenotype score cutoffs to define binary outcomes and using different measures where available to test the robustness of our findings (eMethods in the Supplement). Construction of the PRS follows the methods described by the International Schizophrenia Consortium.4 The PRS was constructed using results from the second Psychiatric Genomics Consortium (PGC) schizophrenia GWAS (eMethods in the Supplement).1 Polygenic scores were calculated for each ALSPAC individual using the PLINK (version 1.07) score command.27 Scores were created by summing the number of risk alleles present for each SNP (0, 1, or 2) weighted by the logarithm of its odds ratio (OR) for schizophrenia from the PGC. Our primary analysis used scores generated from a list of SNPs with a GWAS training-set P ≤. 05 threshold, which is the threshold that maximally captures schizophrenia liability.1 Because the composition of a PRS is a balance between true and null effects,28 scores generated using lists of SNPs meeting a series of P value thresholds and using all independent SNPs meeting genome-wide significance as reported by the PGC schizophrenia GWAS1 were used in sensitivity analyses. Data were analyzed from March 4 to August 13, 2015. We used logistic regression to test the association between outcomes and the schizophrenia PRS. Results are presented as ORs and 95% CIs per SD increase in PRS. Nagelkerke R2 values are also presented as a measure of variance explained. Nonlinear associations between the PRS and outcomes were examined by inclusion of quadratic terms. We examined whether associations with our outcomes were independent by inclusion of all phenotypes within a multivariable model. To correct for multiple testing arising from using different P value thresholds within our sensitivity analyses, we computed permutation-adjusted P values (eMethods in the Supplement). To test whether the effect size of the schizophrenia PRS was the same or different across phenotypes, we used bivariate probit regression to model pairs of outcomes jointly. We tested equality of regression parameters expressing the effect of the schizophrenia PRS (threshold P = .05) on each outcome using a likelihood ratio test to compare a model that allows effect estimates to differ with a model where the PRS effect was constrained to be equal for both outcomes.29,30 All statistical analyses were performed using STATA statistical software (version 13; StataCorp LP). The numbers of individuals who participated in the Psychosis-Like Symptom Interview at 12 and 18 years of age or completed questions relating to negative symptoms at 16.5 years of age and depression and anxiety at 15.5 years of age are shown in Table 1. Of 8230 ALSPAC adolescents whose genetic data passed quality control checks (51.2% male and 48.8% female), 3676 to 5444 participated in assessments from 12 to 18 years of age. We found no strong evidence that individuals who had a higher PRS, and thus increased genetic risk for schizophrenia, had an increased risk for developing psychotic experiences (OR per SD increase in PRS, 1.08; 95% CI, 0.98-1.19; permutation-adjusted P = .14; R2 = 0.001) (Figure, A, and eTable 2 in the Supplement). We observed strong evidence of an association between the schizophrenia PRS and negative symptoms at 16.5 years of age (OR, 1.21; 95% CI, 1.08-1.36; permutation-adjusted P = .001; R2 = 0.007) (Figure, B, and eTable 2 in the Supplement). We also observed strong evidence that individuals with a higher schizophrenia PRS were at an increased risk for anxiety disorder at 15.5 years of age (OR per SD increase in polygenic score, 1.17; 95% CI, 1.06-1.29; permutation-adjusted P = .002; R2 = 0.005) (Figure, D, and eTable 2 in the Supplement). We found no strong evidence of an association between the PRS and depressive disorder at 15.5 years of age (OR per SD increase in polygenic score, 1.02; 95% CI, 0.91-1.13; permutation-adjusted P = .77; R2 = 0.00005) (Figure, C, and eTable 2 in the Supplement). We found no strong evidence to support nonlinear effects of polygenic risk on any of the phenotypes examined. Results per decile of PRS for a training-set threshold of P = .05 are presented in eTable 3 in the Supplement. Associations with negative symptoms and anxiety disorder were independent and persisted when testing all phenotypes within a multivariable model (eTables 4 to 7 in the Supplement). Tetrachoric correlations between each psychopathological outcome are shown in eTable 8 in the Supplement. The results of the bivariate analyses examining whether the schizophrenia PRS (threshold P = .05) effect sizes are similar or different across phenotypes are summarized in Table 2. We observed some evidence that the strong associations between the schizophrenia PRS and negative symptoms and anxiety are different from the association between the PRS and depression (both P = .02), with weaker evidence that they are different from the associations of the PRS with psychotic experiences (P = .14 and P = .11, respectively). We found no strong evidence that the association between the PRS effect and negative symptoms differed from that for anxiety (P = .92). Our results were unchanged when we used different cutoff values or different measurement tools to assess our outcomes (eFigures 1-5 in the Supplement), when we adjusted for parental self-reported history of schizophrenia or depression, or when we excluded individuals with a psychotic disorder at 18 years of age. Results were also consistent across all training-set P value thresholds for almost all outcomes. The exception was psychotic experiences, for which we found weak evidence that increased genetic risk was associated with a decreased risk of psychotic experiences at lower training-set P value thresholds (threshold P ≤ 1 × 10−7; OR per SD increase in polygenic score, 0.90; 95% CI, 0.81-0.99; permutation-adjusted P = .04; R2 = 0.002) (Figure, A, and eTable 2 in the Supplement). In this study, we examined how an increased genetic risk for schizophrenia is manifest phenotypically during adolescence in the general population. We found no strong evidence of an association with the occurrence of psychotic experiences or depressive disorder. However, we found strong evidence that negative symptoms and anxiety disorders were more common in adolescents with a higher genetic risk and that these risks were independent of each other. Although the absence of an association between a genetic risk for schizophrenia and psychotic experiences in adolescence may seem surprising, these findings are consistent with those of previous studies that have examined this relationship.17,18 The estimates of association and strength of evidence in this study are very similar to those from a previous study using ALSPAC,18 although the power in our study is substantially greater given the use of a much larger training set to generate the risk-scoring algorithm. At P value thresholds that maximally capture schizophrenia liability, psychotic experiences were more common in those with higher genetic risk, albeit the CIs included the null. At the most stringent P value thresholds, however, we found weak evidence that genetic risk was associated with reduced psychotic experiences. This finding could be caused by random error or could result from attrition bias. Missing data are likely greater for those who develop a psychotic disorder and for those at high genetic risk. Therefore, psychotic experiences may be underrepresented in participants with high compared with low genetic risk included in these analyses, akin to the apparently protective effect of smoking on Alzheimer disease risk seen using risk rather than rate models of analysis.31 Why this would only be observed at P value thresholds that explain less of the variance for schizophrenia is not clear. Anxiety and negative symptoms might occur as early manifestations of genetic risk for schizophrenia, and we might speculate on possible mechanisms. For example, disturbed biological processes secondary to genetic variation might result in subtle alterations in prediction error processing and attributional salience that might lead to anxiety before the onset of clear-cut psychotic phenomena.36,37 Genetic risk for schizophrenia is also associated with impaired childhood performance IQ in this cohort,38 although we do not know whether variants acting primarily through different brain pathways are differentially related to these phenotypes. Second, genetic risk for schizophrenia may be expressed during adolescence as increased psychotic experiences, anxiety, and negative symptoms, but psychotic experiences may be observed with greater measurement error; thus, associations would be relatively underpowered for this phenotype. Use of a semistructured interview and similar estimates using questionnaires suggest that this explanation is unlikely but cannot be excluded. Although evidence exists of genetic overlap between schizophrenia and major depressive disorder in adults,12,43 we found no evidence to support this overlap in our study. Measures of depression in this study may capture more transient disorders in adolescence that obscure a genetic overlap between schizophrenia and a more persistent, chronic form of depression. Our study has a number of strengths. First, we used the most recent schizophrenia GWAS from the PGC1—the largest schizophrenia data set available—as a training set, thus minimizing measurement error. Second, we used a large, well-characterized, relatively homogeneous, population-based sample for examining psychosis-related phenotypes during adolescence, a key period of development that closely predates the start of the peak in incidence of schizophrenia. Third, we used a semistructured interview to determine the presence of psychotic experiences, as used clinically. We also used multiple measures of depression and anxiety at different ages during adolescence and different cutoffs of these and of measures of psychotic experiences and negative symptoms as sensitivity analyses to test the robustness of our findings. Our study also has a number of limitations. First, despite the use of one of the largest population-based birth cohorts worldwide with the required data, our sample may not be adequately powered to identify small effects of cumulative genetic risk on the phenotypes examined,19 especially given potential differences in heritability across the phenotypes.14,40,41 Given that our sample is too small to estimate heritability of the phenotypes accurately, determining whether the absence of evidence of association between a phenotype and genetic risk for schizophrenia reflects an absence of genetic correlation or inadequate power is difficult. Second, missing data in the cohort could lead to bias in our estimates. Genetic risk for schizophrenia47 and presence of mental health problems are associated with reduced retention in cohort studies, which would tend to underestimate associations. Although selective missingness may have led to overestimates of association, this possibility seems unlikely for some of our phenotypes but not others. A further limitation is that rare genetic variants are not captured by a GWAS; therefore, we are only able to examine the effect of common variants (as captured by the current GWAS) on adolescent phenotype expression. Our results highlight the need for GWAS consortia of schizophrenia to include detailed phenotyping data, to examine the extent to which current GWAS findings relate to specific phenotypes, and to identify genetic variants and pathways that are symptom-domain specific rather than to examine the presence of disorder per se. Furthermore, large population-based longitudinal studies with robust measures of these phenotypic constructs are required to determine how genetic risk for schizophrenia is expressed from childhood through adulthood and whether this expression changes with age, to examine potential mediators and moderators of risk, and to determine the usefulness of genetic risk scores for prediction of transition to psychosis. A better understanding of how genetic risk for schizophrenia manifests during development could inform early recognition of problems in those at greatest risk and potentially inform targeted interventions. Corresponding Author: Hannah J. Jones, PhD, Centre for Academic Mental Health, School of Social and Community Medicine, University of Bristol, Oakfield House, Oakfield Grove, Bristol BS8 2BN, England (hannah.jones@bristol.ac.uk). Submitted for Publication: September 25, 2015; final revision received November 20, 2015; accepted November 22, 2015. Published Online: January 27, 2016. doi:10.1001/jamapsychiatry.2015.3058. Author Contributions: Drs H. J. Jones and Zammit had full access to all the data in the study and take responsibility for the integrity of the data and the accuracy of the data analysis. Study concept and design: H. J. Jones, Stergiakouli, Davey Smith, O’Donovan, Owen, Walters, Zammit. Acquisition, analysis, or interpretation of data: H. J. Jones, Tansey, Hubbard, Heron, Cannon, Holmans, Lewis, Linden, P. B. Jones, Davey Smith, O’Donovan, Walters, Zammit. Drafting of the manuscript: H. J. Jones, Cannon, O’Donovan, Zammit. Statistical analysis: H. J. Jones, Stergiakouli, Tansey, Heron, Holmans. Obtained funding: Cannon, Lewis, Linden, P. B. Jones, Davey Smith, O’Donovan, Owen, Zammit. Administrative, technical, or material support: Stergiakouli, Lewis, Davey Smith, O’Donovan. Study supervision: Stergiakouli, Heron, Davey Smith, O’Donovan, Zammit. Conflict of Interest Disclosures: Dr O’Donovan received a consultancy fee from Roche in July 2015. No other disclosures were reported. Funding/Support: This study was supported by grants G0701503, MR/M006727/1, and MR/K004360/1 from the Medical Research Council, grant 102215/2/13/2 from the Wellcome Trust, and the University of Bristol through core support for the Avon Longitudinal Study of Parents and Children (ALSPAC) and by 23andMe, which supported generation of the genome-wide association data by Sample Logistics and genotyping facilities at the Wellcome Trust Sanger Institute and Laboratory Corporation of America. Drs H. J. Jones, Stergiakouli, Tansey, and Davey Smith are part of the Medical Research Council Integrative Epidemiology Unit at the University of Bristol, which is supported by grant MC_UU_12013/1 from the Medical Research Council and the University of Bristol. Additional Contributions: We thank all the families who participated in this study, the midwives for their help in recruiting the families, and the whole ALSPAC team, which includes interviewers, computer and laboratory technicians, clerical workers, research scientists, volunteers, managers, receptionists, and nurses.